LG has unveiled the Optimus LTE smartphone, the first handset to boast a True HD IPS display and 4G connectivity – the down side is that it's only launching in Korea for now. At 4.5-inches with 326ppi, the display is big news and easily pips Apple's Retina Display in number terms. LG is promising brightness, clarity and colours displayed "in their most natural tones". The LG Optimus LTE is also being toted as the country's highest-res 4G handset, although we're not sure what Samsung and its Galaxy S2 HD will say about that. The screen has been developed in collaboration with LG Display, which also supplies Apple with its mobile screens - so, while we admit it's unlikely, there's a possibility that we'll see a similarly-super HD screen landing on the iPhone 5 or iPhone 4S or whatever Apple decides to launch later on today. In terms of other spec you won't be able to enjoy unless you pop to Korea, the LG Optimus LTE is rocking a 1.5GHz dualcore processor, Android 2.3 (Gingerbread), plus HDMI and DLNA networking. "LG Optimus LTE is the first smartphone in Korea to offer vivid and clear HD content on a 4G network," said Dr. Jong-seok Park, President and CEO of LG Electronics Mobile Communications Company. "Our goal is to be a leading player in LTE devices by continuously offering best-in-class products based on our LTE patents and know-how." 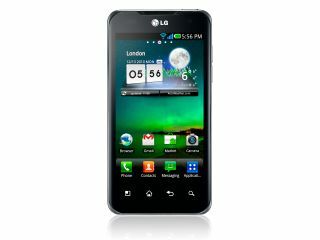 LG is yet to determine whether or not it will sell the LG Optimus LTE outside of Korea, but since we don't have a 4G or LTE network in the UK yet, we're willing to bet this is one handset that will pass us by.